A star map with a cylindrical projection. Su Song's star maps represent the oldest existent ones in printed form. Astronomy is the oldest of the natural sciences, dating back to antiquity, with its origins in the religious, mythological, cosmological, calendrical, and astrological beliefs and practices of prehistory: vestiges of these are still found in astrology, a discipline long interwoven with public and governmental astronomy, and not completely disentangled from it until a few centuries ago in the Western World (see astrology and astronomy). In some cultures, astronomical data was used for astrological prognostication. Early cultures identified celestial objects with gods and spirits. They related these objects (and their movements) to phenomena such as rain, drought, seasons, and tides. It is generally believed that the first astronomers were priests, and that they understood celestial objects and events to be manifestations of the divine, hence early astronomy's connection to what is now called astrology. Ancient structures with possibly astronomical alignments (such as Stonehenge) probably fulfilled astronomical, religious, and social functions. Calendars of the world have often been set by observations of the Sun and Moon (marking the day, month and year), and were important to agricultural societies, in which the harvest depended on planting at the correct time of year. The most common modern calendar is based on the Roman calendar, which broke the traditional link of the month to the phases of the moon and divided the year into twelve months, alternately comprising thirty and thirty-one days. In 46 BC, Julius Caesar instigated calendar reform and adopted what is now known as the Julian calendar, based upon the 365 1⁄4 day year length originally proposed by the 4th century BC Greek astronomer Callippus. Since 1990 our understanding of prehistoric Europeans has been radically changed by discoveries of ancient astronomical artifacts throughout Europe. The artifacts demonstrate that Neolithic and Bronze Age Europeans had a sophisticated knowledge of mathematics and astronomy. Bone sticks from locations like Africa and Europe from possibly as long ago as 35,000 B.C.E are marked in ways that tracked the moon's phases. The Warren Field calendar in the Dee River valley of Scotland's Aberdeenshire. First excavated in 2004 but only in 2013 revealed as a find of huge significance, it is to date the world´s oldest known calendar, created around 8000 BC and predating all other calendars by some 5,000 years. The calendar takes the form of an early Mesolithic monument containing a series of 12 pits which appear to help the observer track lunar months by mimicking the phases of the moon. It also aligns to sunrise at the winter solstice, thus coordinating the solar year with the lunar cycles. The monument had been maintained and periodically reshaped, perhaps up to hundreds of times, in response to shifting solar/lunar cycles, over the course of 6,000 years, until the calendar fell out of use around 4,000 years ago. Goseck circle is located in Germany and belongs to the linear pottery culture. First discovered in 1991, its significance was only clear after results from archaeological digs became available in 2004. The site is one of hundreds of similar circular enclosures built in a region encompassing Austria, Germany, and the Czech Republic during a 200-year period starting shortly after 5000 BC. 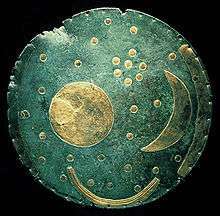 The Nebra sky disc is a Bronze Age bronze disc that was buried in Germany, not far from the Goseck circle, around 1600 BC. It measures about 30 cm diameter with a mass of 2.2 kg and displays a blue-green patina (from oxidization) inlaid with gold symbols. Found by archeological thieves in 1999 and recovered in Switzerland in 2002, it was soon recognized as a spectacular discovery, among the most important of the twentieth century. Investigations revealed that the object had been in use around 400 years before burial (2000 BC), but that its use had been forgotten by the time of burial. The inlaid gold depicted the full moon, a crescent moon about 4 or 5 days old, and the Pleiades star cluster in a specific arrangement forming the earliest known depiction of celestial phenomena. Twelve lunar months pass in 354 days, requiring a calendar to insert a leap month every two or three years in order to keep synchronized with the solar year's seasons (making it lunisolar). The earliest known descriptions of this coordination were recorded by the Babylonians in 6th or 7th centuries BC, over one thousand years later. Those descriptions verified ancient knowledge of the Nebra sky disc's celestial depiction as the precise arrangement needed to judge when to insert the intercalary month into a lunisolar calendar, making it an astronomical clock for regulating such a calendar a thousand or more years before any other known method. The Kokino site, discovered in 2001, sits atop an extinct volcanic cone at an elevation of 1,013 metres (3,323 ft), occupying about 0.5 hectares overlooking the surrounding countryside in the Republic of Macedonia. A Bronze Age astronomical observatory was constructed there around 1900 BC and continuously served the nearby community that lived there until about 700 BC. The central space was used to observe the rising of the sun and full moon. Three markings locate sunrise at the summer and winter solstices and at the two equinoxes. Four more give the minimum and maximum declinations of the full moon: in summer, and in winter. Two measure the lengths of lunar months. Together, they reconcile solar and lunar cycles in marking the 235 lunations that occur during 19 solar years, regulating a lunar calendar. On a platform separate from the central space, at lower elevation, four stone seats (thrones) were made in north-south alignment, together with a trench marker cut in the eastern wall. This marker allows the rising sun's light to fall on only the second throne, at midsummer (about July 31). It was used for ritual ceremony linking the ruler to the local sun god, and also marked the end of the growing season and time for harvest. Golden hats of Germany, France and Switzerland dating from 1400-800 BC are associated with the Bronze Age Urnfield culture. The Golden hats are decorated with a spiral motif of the Sun and the Moon. They were probably a kind of calendar used to calibrate between the lunar and solar calendars. Modern scholarship has demonstrated that the ornamentation of the gold leaf cones of the Schifferstadt type, to which the Berlin Gold Hat example belongs, represent systematic sequences in terms of number and types of ornaments per band. A detailed study of the Berlin example, which is the only fully preserved one, showed that the symbols probably represent a lunisolar calendar. The object would have permitted the determination of dates or periods in both lunar and solar calendars. 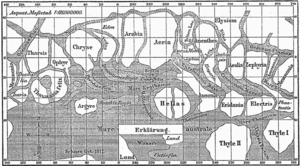 The origins of Western astronomy can be found in Mesopotamia, the "land between the rivers" Tigris and Euphrates, where the ancient kingdoms of Sumer, Assyria, and Babylonia were located. A form of writing known as cuneiform emerged among the Sumerians around 3500–3000 BC. Our knowledge of Sumerian astronomy is indirect, via the earliest Babylonian star catalogues dating from about 1200 BC. The fact that many star names appear in Sumerian suggests a continuity reaching into the Early Bronze Age. Astral theology, which gave planetary gods an important role in Mesopotamian mythology and religion, began with the Sumerians. They also used a sexagesimal (base 60) place-value number system, which simplified the task of recording very large and very small numbers. The modern practice of dividing a circle into 360 degrees, of 60 minutes each, began with the Sumerians. For more information, see the articles on Babylonian numerals and mathematics. Classical sources frequently use the term Chaldeans for the astronomers of Mesopotamia, who were, in reality, priest-scribes specializing in astrology and other forms of divination. The first evidence of recognition that astronomical phenomena are periodic and of the application of mathematics to their prediction is Babylonian. Tablets dating back to the Old Babylonian period document the application of mathematics to the variation in the length of daylight over a solar year. Centuries of Babylonian observations of celestial phenomena are recorded in the series of cuneiform tablets known as the Enūma Anu Enlil. The oldest significant astronomical text that we possess is Tablet 63 of the Enūma Anu Enlil, the Venus tablet of Ammi-saduqa, which lists the first and last visible risings of Venus over a period of about 21 years and is the earliest evidence that the phenomena of a planet were recognized as periodic. The MUL.APIN, contains catalogues of stars and constellations as well as schemes for predicting heliacal risings and the settings of the planets, lengths of daylight measured by a water clock, gnomon, shadows, and intercalations. The Babylonian GU text arranges stars in 'strings' that lie along declination circles and thus measure right-ascensions or time-intervals, and also employs the stars of the zenith, which are also separated by given right-ascensional differences. A significant increase in the quality and frequency of Babylonian observations appeared during the reign of Nabonassar (747–733 BC). The systematic records of ominous phenomena in Babylonian astronomical diaries that began at this time allowed for the discovery of a repeating 18-year cycle of lunar eclipses, for example. The Greek astronomer Ptolemy later used Nabonassar's reign to fix the beginning of an era, since he felt that the earliest usable observations began at this time. The last stages in the development of Babylonian astronomy took place during the time of the Seleucid Empire (323–60 BC). In the third century BC, astronomers began to use "goal-year texts" to predict the motions of the planets. These texts compiled records of past observations to find repeating occurrences of ominous phenomena for each planet. About the same time, or shortly afterwards, astronomers created mathematical models that allowed them to predict these phenomena directly, without consulting past records. A notable Babylonian astronomer from this time was Seleucus of Seleucia, who was a supporter of the heliocentric model. 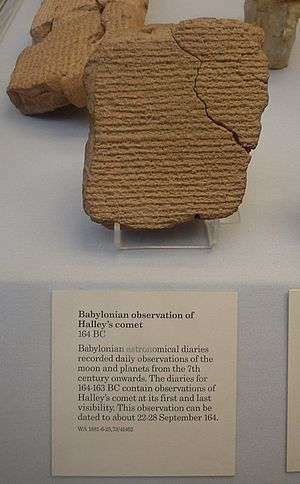 Babylonian astronomy was the basis for much of what was done in Greek and Hellenistic astronomy, in classical Indian astronomy, in Sassanian Iran, in Byzantium, in Syria, in Islamic astronomy, in Central Asia, and in Western Europe. Astronomy in the Indian subcontinent dates back to the period of Indus Valley Civilization during 3rd millennium BCE, when it was used to create calendars. As the Indus Valley civilization did not leave behind written documents, the oldest extant Indian astronomical text is the Vedanga Jyotisha, dating from the Vedic period. Vedanga Jyotisha describes rules for tracking the motions of the Sun and the Moon for the purposes of ritual. During 6th century AD, astronomy was influenced by the Greek and Byzantine astronomical traditions. Aryabhata (476–550), in his magnum opus Aryabhatiya (499), propounded a computational system based on a planetary model in which the Earth was taken to be spinning on its axis and the periods of the planets were given with respect to the Sun. He accurately calculated many astronomical constants, such as the periods of the planets, times of the solar and lunar eclipses, and the instantaneous motion of the Moon. Early followers of Aryabhata's model included Varahamihira, Brahmagupta, and Bhaskara II. Astronomy was advanced during the Shunga Empire and many star catalogues were produced during this time. The Shunga period is known as the "Golden age of astronomy in India". It saw the development of calculations for the motions and places of various planets, their rising and setting, conjunctions, and the calculation of eclipses. Bhāskara II (1114–1185) was the head of the astronomical observatory at Ujjain, continuing the mathematical tradition of Brahmagupta. He wrote the Siddhantasiromani which consists of two parts: Goladhyaya (sphere) and Grahaganita (mathematics of the planets). He also calculated the time taken for the Earth to orbit the sun to 9 decimal places. The Buddhist University of Nalanda at the time offered formal courses in astronomical studies. Other important astronomers from India include Madhava of Sangamagrama, Nilakantha Somayaji and Jyeshtadeva, who were members of the Kerala school of astronomy and mathematics from the 14th century to the 16th century. Nilakantha Somayaji, in his Aryabhatiyabhasya, a commentary on Aryabhata's Aryabhatiya, developed his own computational system for a partially heliocentric planetary model, in which Mercury, Venus, Mars, Jupiter and Saturn orbit the Sun, which in turn orbits the Earth, similar to the Tychonic system later proposed by Tycho Brahe in the late 16th century. Nilakantha's system, however, was mathematically more effient than the Tychonic system, due to correctly taking into account the equation of the centre and latitudinal motion of Mercury and Venus. Most astronomers of the Kerala school of astronomy and mathematics who followed him accepted his planetary model. The Ancient Greeks developed astronomy, which they treated as a branch of mathematics, to a highly sophisticated level. The first geometrical, three-dimensional models to explain the apparent motion of the planets were developed in the 4th century BC by Eudoxus of Cnidus and Callippus of Cyzicus. Their models were based on nested homocentric spheres centered upon the Earth. Their younger contemporary Heraclides Ponticus proposed that the Earth rotates around its axis. A different approach to celestial phenomena was taken by natural philosophers such as Plato and Aristotle. They were less concerned with developing mathematical predictive models than with developing an explanation of the reasons for the motions of the Cosmos. In his Timaeus, Plato described the universe as a spherical body divided into circles carrying the planets and governed according to harmonic intervals by a world soul. 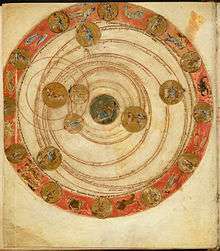 Aristotle, drawing on the mathematical model of Eudoxus, proposed that the universe was made of a complex system of concentric spheres, whose circular motions combined to carry the planets around the earth. This basic cosmological model prevailed, in various forms, until the 16th century AD. In the 3rd century BC Aristarchus of Samos was the first to suggest a heliocentric system, although only fragmentary descriptions of his idea survive. Eratosthenes, using the angles of shadows created at widely separated regions, estimated the circumference of the Earth with great accuracy. Greek geometrical astronomy developed away from the model of concentric spheres to employ more complex models in which an eccentric circle would carry around a smaller circle, called an epicycle which in turn carried around a planet. The first such model is attributed to Apollonius of Perga and further developments in it were carried out in the 2nd century BC by Hipparchus of Nicea. Hipparchus made a number of other contributions, including the first measurement of precession and the compilation of the first star catalog in which he proposed our modern system of apparent magnitudes. The Antikythera mechanism, an ancient Greek astronomical observational device for calculating the movements of the Sun and the Moon, possibly the planets, dates from about 150–100 BC, and was the first ancestor of an astronomical computer. It was discovered in an ancient shipwreck off the Greek island of Antikythera, between Kythera and Crete. The device became famous for its use of a differential gear, previously believed to have been invented in the 16th century AD, and the miniaturization and complexity of its parts, comparable to a clock made in the 18th century. The original mechanism is displayed in the Bronze collection of the National Archaeological Museum of Athens, accompanied by a replica. Depending on the historian's viewpoint, the acme or corruption of physical Greek astronomy is seen with Ptolemy of Alexandria, who wrote the classic comprehensive presentation of geocentric astronomy, the Megale Syntaxis (Great Synthesis), better known by its Arabic title Almagest, which had a lasting effect on astronomy up to the Renaissance. In his Planetary Hypotheses, Ptolemy ventured into the realm of cosmology, developing a physical model of his geometric system, in a universe many times smaller than the more realistic conception of Aristarchus of Samos four centuries earlier. The precise orientation of the Egyptian pyramids affords a lasting demonstration of the high degree of technical skill in watching the heavens attained in the 3rd millennium BC. It has been shown the Pyramids were aligned towards the pole star, which, because of the precession of the equinoxes, was at that time Thuban, a faint star in the constellation of Draco. Evaluation of the site of the temple of Amun-Re at Karnak, taking into account the change over time of the obliquity of the ecliptic, has shown that the Great Temple was aligned on the rising of the midwinter sun. The length of the corridor down which sunlight would travel would have limited illumination at other times of the year. Astronomy played a considerable part in religious matters for fixing the dates of festivals and determining the hours of the night. The titles of several temple books are preserved recording the movements and phases of the sun, moon and stars. The rising of Sirius (Egyptian: Sopdet, Greek: Sothis) at the beginning of the inundation was a particularly important point to fix in the yearly calendar. The Astrologer's instruments (horologium and palm) are a plumb line and sighting instrument. They have been identified with two inscribed objects in the Berlin Museum; a short handle from which a plumb line was hung, and a palm branch with a sight-slit in the broader end. The latter was held close to the eye, the former in the other hand, perhaps at arms length. The "Hermetic" books which Clement refers to are the Egyptian theological texts, which probably have nothing to do with Hellenistic Hermetism. From the tables of stars on the ceiling of the tombs of Rameses VI and Rameses IX it seems that for fixing the hours of the night a man seated on the ground faced the Astrologer in such a position that the line of observation of the pole star passed over the middle of his head. On the different days of the year each hour was determined by a fixed star culminating or nearly culminating in it, and the position of these stars at the time is given in the tables as in the centre, on the left eye, on the right shoulder, etc. According to the texts, in founding or rebuilding temples the north axis was determined by the same apparatus, and we may conclude that it was the usual one for astronomical observations. In careful hands it might give results of a high degree of accuracy. Printed star map of Su Song (1020–1101) showing the south polar projection. The astronomy of East Asia began in China. Solar term was completed in Warring States period. The knowledge of Chinese astronomy was introduced into East Asia. Astronomy in China has a long history. Detailed records of astronomical observations were kept from about the 6th century BC, until the introduction of Western astronomy and the telescope in the 17th century. Chinese astronomers were able to precisely predict eclipses. Much of early Chinese astronomy was for the purpose of timekeeping. The Chinese used a lunisolar calendar, but because the cycles of the Sun and the Moon are different, astronomers often prepared new calendars and made observations for that purpose. Astrological divination was also an important part of astronomy. Astronomers took careful note of "guest stars" which suddenly appeared among the fixed stars. They were the first to record a supernova, in the Astrological Annals of the Houhanshu in 185 A.D. Also, the supernova that created the Crab Nebula in 1054 is an example of a "guest star" observed by Chinese astronomers, although it was not recorded by their European contemporaries. Ancient astronomical records of phenomena like supernovae and comets are sometimes used in modern astronomical studies. The world's first star catalogue was made by Gan De, a Chinese astronomer, in the 4th century BC. Maya astronomical codices include detailed tables for calculating phases of the Moon, the recurrence of eclipses, and the appearance and disappearance of Venus as morning and evening star. The Maya based their calendrics in the carefully calculated cycles of the Pleiades, the Sun, the Moon, Venus, Jupiter, Saturn, Mars, and also they had a precise description of the eclipses as depicted in the Dresden Codex, as well as the ecliptic or zodiac, and the Milky Way was crucial in their Cosmology. A number of important Maya structures are believed to have been oriented toward the extreme risings and settings of Venus. To the ancient Maya, Venus was the patron of war and many recorded battles are believed to have been timed to the motions of this planet. Mars is also mentioned in preserved astronomical codices and early mythology. Although the Maya calendar was not tied to the Sun, John Teeple has proposed that the Maya calculated the solar year to somewhat greater accuracy than the Gregorian calendar. Both astronomy and an intricate numerological scheme for the measurement of time were vitally important components of Maya religion. Arabic astrolab from 1208 AD. The Arabic and the Persian world under Islam had become highly cultured, and many important works of knowledge from Greek astronomy and Indian astronomy and Persian astronomy were translated into Arabic, used and stored in libraries throughout the area. An important contribution by Islamic astronomers was their emphasis on observational astronomy This led to the emergence of the first astronomical observatories in the Muslim world by the early 9th century. Zij star catalogues were produced at these observatories. In the 10th century, Abd al-Rahman al-Sufi (Azophi) carried out observations on the stars and described their positions, magnitudes, brightness, and colour and drawings for each constellation in his Book of Fixed Stars. He also gave the first descriptions and pictures of "A Little Cloud" now known as the Andromeda Galaxy. He mentions it as lying before the mouth of a Big Fish, an Arabic constellation. This "cloud" was apparently commonly known to the Isfahan astronomers, very probably before 905 AD. The first recorded mention of the Large Magellanic Cloud was also given by al-Sufi. In 1006, Ali ibn Ridwan observed SN 1006, the brightest supernova in recorded history, and left a detailed description of the temporary star. In the late 10th century, a huge observatory was built near Tehran, Iran, by the astronomer Abu-Mahmud al-Khujandi who observed a series of meridian transits of the Sun, which allowed him to calculate the tilt of the Earth's axis relative to the Sun. He noted that measurements by earlier (Indian, then Greek) astronomers had found higher values for this angle, possible evidence that the axial tilt is not constant but was in fact decreasing. In 11th-century Persia, Omar Khayyám compiled many tables and performed a reformation of the calendar that was more accurate than the Julian and came close to the Gregorian. Other Muslim advances in astronomy included the collection and correction of previous astronomical data, resolving significant problems in the Ptolemaic model, the development of the universal latitude-independent astrolabe by Arzachel, the invention of numerous other astronomical instruments, Ja'far Muhammad ibn Mūsā ibn Shākir's belief that the heavenly bodies and celestial spheres were subject to the same physical laws as Earth, the first elaborate experiments related to astronomical phenomena, the introduction of exacting empirical observations and experimental techniques, and the introduction of empirical testing by Ibn al-Shatir, who produced the first model of lunar motion which matched physical observations. Natural philosophy (particularly Aristotelian physics) was separated from astronomy by Ibn al-Haytham (Alhazen) in the 11th century, by Ibn al-Shatir in the 14th century, and Qushji in the 15th century, leading to the development of an astronomical physics. Ninth century diagram of the positions of the seven planets on 18 March 816. After the significant contributions of Greek scholars to the development of astronomy, it entered a relatively static era in Western Europe from the Roman era through the 12th century. This lack of progress has led some astronomers to assert that nothing happened in Western European astronomy during the Middle Ages. Recent investigations, however, have revealed a more complex picture of the study and teaching of astronomy in the period from the 4th to the 16th centuries. Western Europe entered the Middle Ages with great difficulties that affected the continent's intellectual production. The advanced astronomical treatises of classical antiquity were written in Greek, and with the decline of knowledge of that language, only simplified summaries and practical texts were available for study. The most influential writers to pass on this ancient tradition in Latin were Macrobius, Pliny, Martianus Capella, and Calcidius. In the 6th Century Bishop Gregory of Tours noted that he had learned his astronomy from reading Martianus Capella, and went on to employ this rudimentary astronomy to describe a method by which monks could determine the time of prayer at night by watching the stars. In the 7th Century the English monk Bede of Jarrow published an influential text, On the Reckoning of Time, providing churchmen with the practical astronomical knowledge needed to compute the proper date of Easter using a procedure called the computus. This text remained an important element of the education of clergy from the 7th century until well after the rise of the Universities in the 12th century. The range of surviving ancient Roman writings on astronomy and the teachings of Bede and his followers began to be studied in earnest during the revival of learning sponsored by the emperor Charlemagne. By the 9th century rudimentary techniques for calculating the position of the planets were circulating in Western Europe; medieval scholars recognized their flaws, but texts describing these techniques continued to be copied, reflecting an interest in the motions of the planets and in their astrological significance. Building on this astronomical background, in the 10th century European scholars such as Gerbert of Aurillac began to travel to Spain and Sicily to seek out learning which they had heard existed in the Arabic-speaking world. There they first encountered various practical astronomical techniques concerning the calendar and timekeeping, most notably those dealing with the astrolabe. 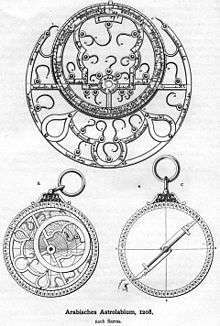 Soon scholars such as Hermann of Reichenau were writing texts in Latin on the uses and construction of the astrolabe and others, such as Walcher of Malvern, were using the astrolabe to observe the time of eclipses in order to test the validity of computistical tables. By the 12th century, scholars were traveling to Spain and Sicily to seek out more advanced astronomical and astrological texts, which they translated into Latin from Arabic and Greek to further enrich the astronomical knowledge of Western Europe. The arrival of these new texts coincided with the rise of the universities in medieval Europe, in which they soon found a home. Reflecting the introduction of astronomy into the universities, John of Sacrobosco wrote a series of influential introductory astronomy textbooks: the Sphere, a Computus, a text on the Quadrant, and another on Calculation. In the 14th century, Nicole Oresme, later bishop of Liseux, showed that neither the scriptural texts nor the physical arguments advanced against the movement of the Earth were demonstrative and adduced the argument of simplicity for the theory that the earth moves, and not the heavens. However, he concluded "everyone maintains, and I think myself, that the heavens do move and not the earth: For God hath established the world which shall not be moved." In the 15th century, cardinal Nicholas of Cusa suggested in some of his scientific writings that the Earth revolved around the Sun, and that each star is itself a distant sun. He was not, however, describing a scientifically verifiable theory of the universe. Galileo Galilei (1564–1642) crafted his own telescope and discovered that our Moon had craters, that Jupiter had moons, that the Sun had spots, and that Venus had phases like our Moon. The renaissance came to astronomy with the work of Nicolaus Copernicus, who proposed a heliocentric system, in which the planets revolved around the Sun and not the Earth. 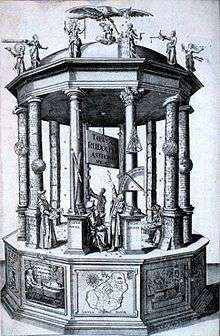 His De revolutionibus provided a full mathematical discussion of his system, using the geometrical techniques that had been traditional in astronomy since before the time of Ptolemy. His work was later defended, expanded upon and modified by Galileo Galilei and Johannes Kepler. 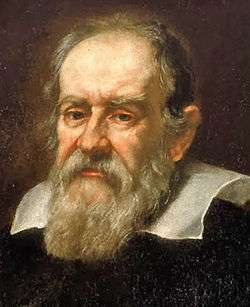 Galileo was considered the father of observational astronomy. He was among the first to use a telescope to observe the sky and after constructing a 20x refractor telescope he discovered the four largest moons of Jupiter in 1610. This was the first observation of satellites orbiting another planet. He also found that our Moon had craters and observed (and correctly explained) sunspots. Galileo noted that Venus exhibited a full set of phases resembling lunar phases. Galileo argued that these observations supported the Copernican system and were, to some extent, incompatible with the favored model of the Earth at the center of the universe. He may have even observed the planet Neptune in 1612 and 1613, over 200 years before it was discovered, but it is unclear if he was aware of what he was looking at. Although the motions of celestial bodies had been qualitatively explained in physical terms since Aristotle introduced celestial movers in his Metaphysics and a fifth element in his On the Heavens, Johannes Kepler was the first to attempt to derive mathematical predictions of celestial motions from assumed physical causes. Combining his physical insights with the unprecedentedly accurate naked-eye observations made by Tycho Brahe, Kepler discovered the three laws of planetary motion that now carry his name. Isaac Newton developed further ties between physics and astronomy through his law of universal gravitation. Realising that the same force that attracted objects to the surface of the Earth held the moon in orbit around the Earth, Newton was able to explain – in one theoretical framework – all known gravitational phenomena. In his Philosophiae Naturalis Principia Mathematica, he derived Kepler's laws from first principles. Newton's theoretical developments lay many of the foundations of modern physics. Outside of England, Newton's theory took some time to become established. Descartes' theory of vortices held sway in France, and Huygens, Leibniz and Cassini accepted only parts of Newton's system, preferring their own philosophies. It wasn't until Voltaire published a popular account in 1738 that the tide changed. In 1748, the French Academy of Sciences offered a reward for solving the perturbations of Jupiter and Saturn which was eventually solved by Euler and Lagrange. Laplace completed the theory of the planets towards the end of the century. Edmund Halley succeeded Flamsteed as Astronomer Royal in England and succeeded in predicting the return in 1758 of the comet that bears his name. Sir William Herschel found the first new planet, Uranus, to be observed in modern times in 1781. The gap between the planets Mars and Jupiter disclosed by the Titius–Bode law was filled by the discovery of the asteroids Ceres and Pallas in 1801 with many more following. At first, astronomical thought in America was based on Aristotelian philosophy, but interest in the new astronomy began to appear in Almanacs as early as 1659. In the 19th century it was discovered that, when decomposing the light from the Sun, a multitude of spectral lines were observed (regions where there was less or no light). Experiments with hot gases showed that the same lines could be observed in the spectra of gases, specific lines corresponding to unique elements. It was proved that the chemical elements found in the Sun (chiefly hydrogen and helium) were also found on Earth. During the 20th century spectroscopy (the study of these lines) advanced, especially because of the advent of quantum physics, that was necessary to understand the observations. Although in previous centuries noted astronomers were exclusively male, at the turn of the 20th century women began to play a role in the great discoveries. In this period prior to modern computers, women at the United States Naval Observatory (USNO), Harvard University, and other astronomy research institutions began to be hired as human "computers," who performed the tedious calculations while scientists performed research requiring more background knowledge. A number of discoveries in this period were originally noted by the women "computers" and reported to their supervisors. For example, at the Harvard Observatory Henrietta Swan Leavitt discovered the cepheid variable star period-luminosity relation which she further developed into a method of measuring distance outside of our solar system. Annie Jump Cannon, also at Harvard, organized the stellar spectral types according to stellar temperature. In 1847, Maria Mitchell discovered a comet using a telescope. According to Lewis D. Eigen, Cannon alone, "in only 4 years discovered and catalogued more stars than all the men in history put together." Most of these women received little or no recognition during their lives due to their lower professional standing in the field of astronomy. Although their discoveries and methods are taught in classrooms around the world, few students of astronomy can attribute the works to their authors or have any idea that there were active female astronomers at the end of the 19th century. 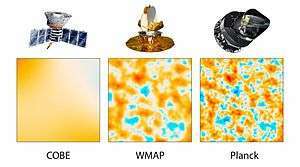 Comparison of CMB (Cosmic microwave background) results from satellites COBE, WMAP and Planck documenting a progress in 1989-2013. Most of our current knowledge was gained during the 20th century. With the help of the use of photography, fainter objects were observed. Our sun was found to be part of a galaxy made up of more than 1010 stars (10 billion stars). The existence of other galaxies, one of the matters of the great debate, was settled by Edwin Hubble, who identified the Andromeda nebula as a different galaxy, and many others at large distances and receding, moving away from our galaxy. Physical cosmology, a discipline that has a large intersection with astronomy, made huge advances during the 20th century, with the model of the hot big bang heavily supported by the evidence provided by astronomy and physics, such as the redshifts of very distant galaxies and radio sources, the cosmic microwave background radiation, Hubble's law and cosmological abundances of elements. In the 19th century, scientists began discovering forms of light which were invisible to the naked eye: X-Rays, gamma rays, radio waves, microwaves, ultraviolet radiation, and infrared radiation. This had a major impact on astronomy, spawning the fields of infrared astronomy, radio astronomy, x-ray astronomy and finally gamma-ray astronomy. With the advent of spectroscopy it was proven that other stars were similar to our own sun, but with a range of temperatures, masses and sizes. The existence of our galaxy, the Milky Way, as a separate group of stars was only proven in the 20th century, along with the existence of "external" galaxies, and soon after, the expansion of the universe seen in the recession of most galaxies from us. ↑ "The Beginning of Time?". University of Birmingham. 2013. ↑ "'World's oldest calendar' discovered in Scottish field". BBC News. 2013. ↑ "World's Oldest Calendar Discovered in U.K.". Roff Smith, National Geographic. July 15, 2013. ↑ "Sonnenobservatorium Goseck". Sonnenobservatorium Goseck. ↑ "Europe Before Rome: A Site-by-Site Tour of the Stone, Bronze, and Iron Ages". T. Douglas Price, Oxford University Press. 2013. p. 262. ↑ "The Mayan and Other Ancient Calendars". Geoff Stray, Bloomsbury Publishing USA. 2007. p. 14. 1 2 Pierre-Yves Bely; Carol Christian; Jean-René Roy. A Question and Answer Guide to Astronomy. Cambridge University Press. p. 197. ↑ Neugebauer, O. (1952) Tamil Astronomy: A Study in the History of Astronomy in India. Osiris, 10:252-276. ↑ Thurston, H., Early Astronomy. Springer, 1994, p.178-188. ↑ Ruggles, C.L.N. (2005), Ancient Astronomy, pages 354–355. ABC-Clio. ISBN 1-85109-477-6. ↑ Krupp, E.C. (1988). "Light in the Temples", in C.L.N. Ruggles: Records in Stone: Papers in Memory of Alexander Thom. CUP, 473–499. ISBN 0-521-33381-4. ↑ Neugebauer O., Egyptian Planetary Texts, Transactions, American Philosophical Society, Vol. 32, Part 2, 1942, Page 237. ↑ A. F. Aveni, Skywatchers of Ancient Mexico, (Austin: Univ. of Texas Pr., 1980), pp. 173–99. ↑ A. F. Aveni, Skywatchers of Ancient Mexico, (Austin: Univ. of Texas Pr., 1980), pp. 170–3. ↑ Micheau, Francoise, The Scientific Institutions in the Medieval Near East, pp. 992–3 , in Roshdi Rashed & Régis Morelon (1996), Encyclopedia of the History of Arabic Science, pp. 985–1007, Routledge, London and New York. ↑ "Observatoire de Paris (Abd-al-Rahman Al Sufi)". Retrieved 2007-04-19. ↑ "Observatoire de Paris (LMC)". Retrieved 2007-04-19. ↑ O'Connor, John J.; Robertson, Edmund F., "Abu Mahmud Hamid ibn al-Khidr Al-Khujandi", MacTutor History of Mathematics archive, University of St Andrews . ↑ George Saliba (1994). "Early Arabic Critique of Ptolemaic Cosmology: A Ninth-Century Text on the Motion of the Celestial Spheres", Journal for the History of Astronomy 25, pp. 115–141 . ↑ Toby Huff, The Rise of Early Modern Science, p. 326. Cambridge University Press, ISBN 0-521-52994-8. ↑ Y. M. Faruqi (2006). "Contributions of Islamic scholars to the scientific enterprise", International Education Journal 7 (4), pp. 395–396. ↑ Roshdi Rashed (2007). "The Celestial Kinematics of Ibn al-Haytham", Arabic Sciences and Philosophy 17, p. 7-55. Cambridge University Press. ↑ F. Jamil Ragep (2001), "Tusi and Copernicus: The Earth's Motion in Context", Science in Context 14 (1-2), p. 145–163. Cambridge University Press. ↑ Henry Smith Williams, The Great Astronomers (New York: Simon and Schuster, 1930), pp. 99–102 describes "the record of astronomical progress" from the Council of Nicea (325 AD) to the time of Copernicus (1543 AD) on four blank pages. ↑ Bruce S. Eastwood, Ordering the Heavens: Roman Astronomy and Cosmology in the Carolingian Renaissance, (Leiden: Brill, 2007) ISBN 978-90-04-16186-3. ↑ Stephen C. McCluskey, Astronomies and Cultures in Early Medieval Europe, (Cambridge: Cambridge University Press, 1999), pp. 101–110 ISBN 0-521-77852-2. ↑ Stephen C. McCluskey, Astronomies and Cultures in Early Medieval Europe, (Cambridge: Cambridge University Press, 1999), pp. 131–164 ISBN 0-521-77852-2. ↑ Stephen C. McCluskey, Astronomies and Cultures in Early Medieval Europe, (Cambridge: Cambridge University Press, 1999), pp. 171–187 ISBN 0-521-77852-2. ↑ Stephen C. McCluskey, Astronomies and Cultures in Early Medieval Europe, (Cambridge: Cambridge University Press, 1999), pp. 188–192 ISBN 0-521-77852-2. ↑ Nicole Oresme, Le Livre du ciel et du monde, xxv, ed. A. D. Menut and A. J. Denomy, trans. A. D. Menut, (Madison: Univ. of Wisconsin Pr., 1968), quotation at pp. 536–7. ↑ Britt, Robert Roy (2009). "Galileo discovered Neptune, new theory claims". MSNBC News. Retrieved 10 July 2009. ↑ Bruce Stephenson, Kepler's physical astronomy, (New York: Springer, 1987), pp. 67–75. ↑ "[Kepler's] revolutionary role lay in his successful attempt to solve the problem of uniting astronomy and natural philosophy which had been sought for two thousand years." P. 484 in Wilbur Applebaum, "Keplerian Astronomy after Kepler: Researches and Problems," History of Science, 34 (1996): 451–504. ↑ The average error of Tycho's stellar observations, as recorded in his observational logs, varied from 32.3" to 48.8" for different instruments. Table 4 in Walter G. Wesley, "The Accuracy of Tychho Brahe's Instruments," Journal for the History of Astronomy, 9(1978): 42–53. ↑ An error of as much as 3' was introduced into some of the stellar positions published in Tycho's star catalog due to Tycho's application of an erroneous ancient value of parallax and his neglect of refraction. See Dennis Rawlins, "Tycho's 1004 Star Catalog", DIO 3 (1993), p. 20. ↑ Bryant, Walter W. (1907). A History of Astronomy. p. 53. ↑ Brasch, Frederick (October 1931), "The Royal Society of London and its Influence upon Scientific Thought in the American Colonies", The Scientific Monthly, 33 (4): 338. ↑ Morison, Samuel Eliot (March 1934), "The Harvard School of Astronomy in the Seventeenth Century", The New England Quarterly, 7: 7, doi:10.2307/359264. Pingree, David (1998), "Legacies in Astronomy and Celestial Omens", in Dalley, Stephanie, The Legacy of Mesopotamia, Oxford University Press, pp. 125–137, ISBN 0-19-814946-8 .